If you are a person who has both a) struggled with their weight, and b) access to the internet, you have probably read about the study done on the Season 8 Biggest Loser contestants. To summarize, six years later and their metabolisms are wrecked. All of them need to eat amounts of food equal to people who weigh far less than they do just to maintain. They are doomed. All of us who have ever been significantly overweight are doomed. And I don’t disagree. Bear with me here, because while we are most likely doomed, we’re not doomed in the way you think. And it’s not hopeless. Just to get this out of the way up front, I am a ranking member of the completely doomed weight club. Standing at 5'4", I went over 200 lbs at 18 years old, and maxed out at around 250lbs somewhere in my mid-twenties. My weight then fluctuated between 220 and 240 until about nine and a half years ago when something massively shifted in my brain. Over the next year and a half, I lost 100lbs and have more or less stayed there ever since. No bypass surgery, no special diets or programs. Me in my mid-twenties; me now. According to the article, I’m one of the rare special unicorns who has been magically gifted with the ability to overcome all primal urges, hunger, and brain chemistry to maintain the low calories my metabolism challenged body now requires to not gain all the weight back over the long term. My mom would’ve argued with this, but I don’t think I’m a rare special unicorn. At least not about this. And I don’t think I have any more will than anyone else, should they choose. What I do think, is that after years of losing and failing to maintain those loses, I made an uncommon realization and, without even being fully aware of it, came to a deep acceptance of the aforementioned doom. And that was key. I believe one of the two worst things our commodification of the diet industry has done is to sell us on the idea that losing weight is easy, fast, and painless. I believe one of the two worst things our commodification of the diet industry has done is to sell us on the idea that losing weight is easy, fast, and painless (the other being that you have to be thin to be happy). Anyone who has ever tried to lose weight and keep it off knows, deep down, that this isn’t true. But we want to believe it is. They tell us it’s easy, because selling a difficult diet program is, well, difficult. If we fail, it’s just because we haven’t found the right thing. Maybe it’s the low carb, or the high exercise, or the liquid diet, or the next thing. Because when we find the right thing, gosh, it’ll be effortless. This is the lie that’s dooming us. Studies are now, more and more, showing us that those of us who are or have been significantly overweight are, indeed, different. Our bodies want to weigh more, sometimes a lot more, and employ all kinds of completely unfair methods to get and keep our weight high. Our bodies have clearly never read the bathing suit issue of any magazine. It is, completely and utterly, unfair. Doomed. Still there? There’s hope. While we are doomed to fighting our bodies, we are not doomed to being massively overweight, which is what everyone is assuming. 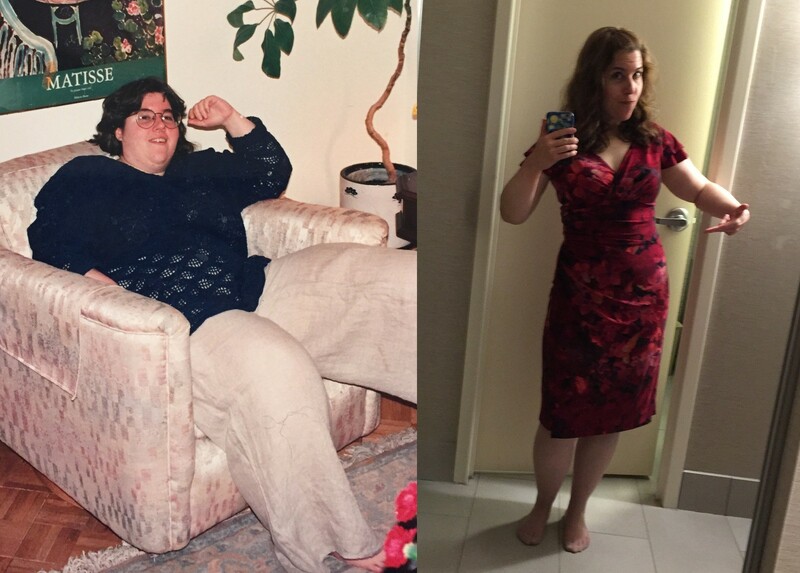 I mean, here I am, still maintaining eight years after spending my entire adult life being obese. How I did it is I accepted the doom. I accepted the unfairness of all of it and made it my new normal. I know, because it’s been voiced many times to me, that people think it’s easy for me. Easy for me to walk past the cookies, easy to say no to extra helpings, easy to cut added sugars, easy to exercise regularly. I’m telling you now, it is not easy. It is hella hard. I’m hungry to some degree ALL THE TIME. I have cravings. I battle with binge eating disorder. I deeply, passionately love sugar. Hell, I have a blog devoted to pie. After eight years I’m still counting calories (old school, on a calculator and in my head), tracking macros, measuring portions, and weighing myself weekly. I’ve taught myself how to recognize a reasonable portion logically, even if I can’t do it emotionally. I don’t let myself skip a workout unless I’m sick or injured, although I don’t kill myself with workouts either. And I have accepted that eating less than everyone else is my normal. Is it unfair? Yes. Very. But life isn’t fair for anyone. My mom died from brain cancer. People are made refuges by war. Others struggle with poverty or disease. If this is my particular slice of unfairness, I’m okay with that. And, surprising even to me, I’m happy and I enjoy food a lot more than I used to. While I have to eat less, and forgo sugary treats most of the time, I still eat well. I come from a family of foodies, and I know how to cook. I make pasta, and pizza, and falafel, and burritos, and chocolate muffins on the regular. I’m forced to think creatively, but that’s probably for the best. My doctor’s pretty happy with me too after having elevated blood pressure at only 24 — now 100/60, booyah. There’s definitely a massive upside to any sacrifices. You are doomed to the struggle, but not to losing the struggle. I think, at least until science figures out a pill or something, this is what you’ve got to do if you want to maintain any weight loss. Accept that it is unfair, hard, slow, and never-ending. You can take some time to grieve the loss of that fairness, that’s ok, I certainly did. But the hard truth is that being angry or sad about it, isn’t going to change it. This is where you are, and this is what you’re up against. And you can, if you want to, choose everyday to fight and move forward. I have. I did today and I will tomorrow. You are doomed to the struggle, but not to losing the struggle. And because this wouldn’t truly be a weight loss article without tips, here are seven things, in no particular order, I’ve learned along the way that have helped me and could apply to almost anyone (Caveat: If you have a medical condition or are on a medication that makes it difficult to maintain a healthy weight, these tips are still good, but you need to work with your doctor. Your normal is a yet different one.). I’m going to say something that you’ve heard a million times and never believe: Being thin does not make you happy. It’s true. Sorry. If you are unhappy, find a trained professional to talk to. Finding some peace with yourself may not make you thin, but I don’t believe long term weight loss is possible without it, certainly not without developing disordered eating issues. I’d go so far as to say that any healthy weight loss journey should start with what’s in your head and not what’s on your plate. Anything is better than nothing. Or, if you prefer, the perfect is the enemy of the good. Question: How many times have you decided to “postpone” your diet until tomorrow because two hours into the day you had a cookie? I honestly have zero idea because I’ve done it so many times I’ve lost count. Saying everything has to be perfect or you’re going to throw it all out the window is both ludicrous and a recipe for failure. And it doesn’t just pertain to calories or day to day eating. You might try adopting a strict or restrictive eating or exercise plan, then saying you if you can’t stick to it, you won’t do anything. Here’s the thing: You are a human being. Sometimes you’ll be on a roll, everything perfect, everything falling into place. But, sooner or later, you’re going to mess up. And the stricter the thing you’re trying to stick to is, the faster that mess up will come. It’s what you do with those off moments that make or break your goals, not what you do when you’re “on”. Moderation in the good and bad days keeps you out of the starve/binge cycle, and keeps your goals on track. When you slip up, whether it’s just for a snack (that damn cookie), or a day, or a week, make it your goal to ease yourself back on track as soon as possible. Don’t abandon ship just because you’ve sprung a leak. Why are we in such a tremendous rush to lose weight as quickly as possible (Answer: Diet industry impossible promises.)? You probably didn’t gain the weight at a steady rate of 2–3 pounds a week, but you drive yourself into the ground trying to lose it that fast. It just doesn’t work. You may lose some or a lot massively cutting calories, but almost no one maintains those loses. Radical thought, instead of focusing on weight loss, focus on just maintaining where ever you are now. Make that your primary goal. As much as you feel you may weigh at the moment, you will do yourself a world of good if you can just not gain any more. Take this test: Sit down and try to remember all the times you’ve lost weight and about how much you lost each time. Add it all up and subtract it from whatever you now weigh. Is that number near your goal weight? At your goal? Under it? Or are you, like me, dead from non-existence because you are now looking at a negative number? What if you only lost one pound a month, but whenever you lost that pound you kept it off. At the end of four years you will have lost 50 pounds and will be well practiced at maintaining it as you’ve done just that losing it so slowly. It’s a winning strategy. Eat less added sugar. Drink more water. I know I said there’s no special “diet” you need to eat to lose weight and keep it off. That’s still true. However, if your diet consists primarily of junk, even if it’s low in calories, you will end up not very healthy and probably eventually on the road to eating to much in the future. Your body may not be very good a recognizing when you’ve had the proper amount of food, but you can help it along by putting good, real food into it. I think everyone can benefit from cutting back on added sugar and drinking lots of water. You don’t need to go nuts and eat no added sugar, but following the guidelines of max 6 tsp (24 grams) for women and 9 tsp (36 grams) for men most days would help put you on a good course. This won’t make you magically shed the pounds, low sugar foods still have calories, sometimes a lot of them (I’m looking at you almond butter). However, high sugar foods tend to be high calorie, so if you cut back on them, you may well find it easier to eat less overall. And for heaven’s sake, just stop it with the daily sodas. It’s an indulgence, not a daily necessity, treat it like that. Make a peace with feeling hungry. If all this recent science is right, and you are or have been significantly overweight, you are going to feel hungry most of the time. Even if you’ve eaten more than enough to maintain whatever your current weight is. You are going to have to learn to live with this hunger if you want to maintain any weight loss. Being hungry is unpleasant, sometimes painful, but ultimately there are many worse things than feeling hungry. Like I said, I’m hungry most of time, but I’m okay. I am, and you’re going to have to trust me on this, most definitely not miserable or tortured. The main reason why is because I’ve completely accepted hunger as my companion in life and I’ve stopped demonizing and being afraid of it. That said, I’m also careful not to take it too far and starve myself down to unhealthfully low weights. Calorie counting works to help with that too. I’ve learned that I just can’t completely trust must stomach to correctly tell me when I’ve had too much or too little. You can too. Stop exercising to lose weight, and start exercising to be healthy. You can’t outrun your fork. That before picture of me? Would you believe that girl worked out, and worked out hard, 4–5 days a week on a regular basis for years? She did. I’ve always loved exercise, always. I’m a weirdo like that. But at an average burn of about 100 calories for every ten minutes exercising at a moderate to intense rate, you’d have to work out like a fanatic every day for hours on end to make up for eating 5,000+ calories a day. The math is against you. Exercise is fantastic for you, and you absolutely should do it regularly. Studies have shown that most people who are able to maintain weight loss exercise regularly. It’s just the best. Especially weight training. Just do it. Just don’t do it thinking it’s going to erase eating doughnuts nonstop. Just as we’ve learned that, for some of us, our bodies are belligerently determined to keep us heavy, we’re also learning that being heavy isn’t the health-death sentence we’ve believed. We’re also at the beginnings of a new and wonderful body positivity movement. You really, truly, really do not have to be skinny to be healthy, happy, and beautiful (you men, you’re beautiful too). The diet industry has lied and lied and lied to sell you it’s crappy plans for decades now. Stop believing them. That said, you may still want to lose weight, that’s awesome too. But maybe instead of aiming for some impossibly tiny number that will necessitate literal starvation to achieve, you aim a bit higher and feel great about just weighing less without having to eat nothing but celery to maintain it. My advice is think long and hard about how low you really need or want to go and what sacrifices you are actually willing to make to get and stay there. You may find that you are infinitely happier being a couple of sizes larger than your “dream” goal as you’ll able to maintain that and still eat pizza. I strongly encourage you to read about body positivity. It’s not about glamorizing obesity, it’s about loving and accepting our unique bodies in all the shapes they come in. See tip #1. Stop blaming yourself for any lack of success with your weight. The diet industry, and our profound misunderstanding of our bodies carry the only blame here. If you need and want to be healthier, you can achieve it (again, those with medical conditions can have unique challenges, consult with your doctor). You are strong, you are good, you are worthy, and you are beautiful. I wish you the best of luck with everything.